If you haven't seen it, Le Fabuleux Destin d'Amélie Poulain (2001) is a charming film with Audrey Tautou in the starring role. Amélie, a shy waitress with a vivid imagination, decides to help lonely people with their lives and goes about it in some unexpected ways. She mixes fantasy with reality giving the movie an almost surreal look (in the nicest sense of the word). With fantastic shots of Paris, especially around Montmartre, it’s a “must see” for us Francophiles. The winding streets, Sacre Coeur.....all beautiful. ﻿﻿On one of our walks we came across the Café des 2 Moulins where several of the scenes were shot. 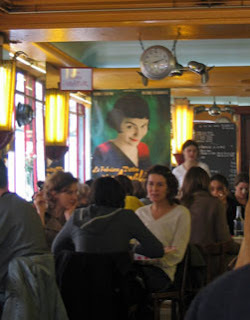 Of course they did a few alterations here and there, and now there is a huge poster of Amélie on the wall, but it was fun to sit in “Amélie’s” Café and remember the adventures in the movie. While we were sitting having our coffee, some young girls came in and were thrilled to see the Café. No not thrilled, THRILLED! They didn't want to order anything , all they wanted to do was have their picture taken inside. The owners very graciously allowed them to go ahead which I thought was extremely accommodating seeing as the place was crowded. (Parisians are so nice). I'm such a good photographer. Look how I got all the words in! If you haven't seen the movie, you're in for a treat. If you have seen it, maybe it's time for another viewing! My girls LOVE that movie! I love Amelie. Both my boys do too. I really really love A Very Long Engagement, also directed by Jean-Pierre Jeunet and starring Tautou. It's my favourite film. Thanks for the tip. A Very Long Engagement is now on my list to rent very soon!